Lecturer Tom Hammick, who teaches on BA (Hons) Fine Art Painting, joins Peter Blake, Jeremy Deller, Mona Hartoum, Chris Orr, Elizabeth Magill and David Mach as one of the seven artists chosen to celebrate the NHS at 70. The seven artists were commissioned by the Imperial Health Charity to create healthcare-inspired prints that will be sold to raise money for London hospitals. The artworks are being sold online and will then be reprinted for a touring exhibition of London hospitals. Ten sets of prints will also be donated to different hospitals to keep permanently. 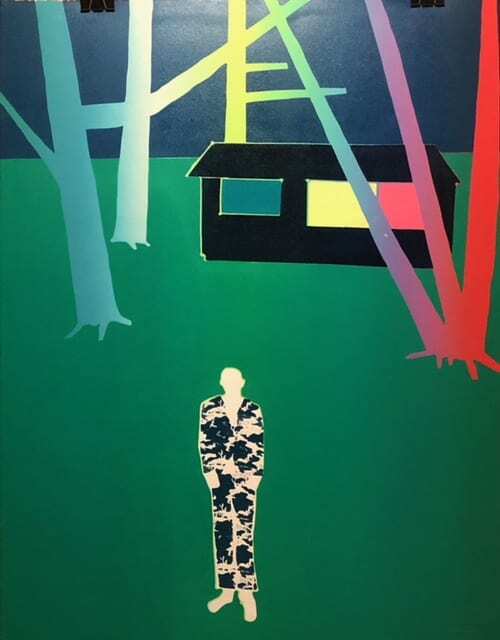 Tom said of his print Andrzej’s Cabin (pictured): “In the late 60’s and 70’s, where I lived in the country outside London as a boy, there were two characters who lived off grid, in a handmade shed and an old drover’s wagon. It was, as I saw it, a romantic life on the fringe that I craved for myself, and still do. These ‘outcasts’, living on the edge of society, have mostly disappeared from life as computerisation and the digitisation of our day to day existence has meant that to gain access to the benefits of a universal Health System and the safety net of the most basic social benefits, we have all, to some extent, lost much of our personal privacy – the very things these loners were hiding from in the first place. The sale is currently live on CCA Galleries’ website. All proceeds will go towards the Imperial Health Charity’s network of London hospitals. This entry was posted in Fine Art, Staff, What's on and tagged CCA Galleries, Imperial Health Charity, NHS 70.